Hugo Woman (Eau de Toilette) is a perfume by Hugo Boss for women and was released in 1997. The scent is fresh-floral. The production was apparently discontinued. Hello and have a nice evening, everybody. Today I describe the fragrance "Woman" (EDT) by Hugo Boss. Since I'm sure that pretty much everyone should know this scent, I'll keep it short tonight and describe it quickly. Oh yes, and don't be angry if you find the scent divine or if it is even a classic for you, because I didn't really like it! I actually smell exactly what is in the top note of the fragrance pyramid. Aquatic notes with green, sour apple. In addition there are slightly stuffy flowers or blooms, which I cannot assign however. According to the description it could be the lilies, at the beginning they smell more like freesias to me, but what do I know about flowers?! Anyway, the beginning is fresh and loose. The Sillage is mediocre to rather weak, so it is best to smell it only from close up. The shelf life should be about five hours (maybe even longer,... as I said I couldn't stand the scent after a few hours...), that's okay with summery scents. The bottle is the rounder form of the well-known "field bottle", so you can also see the screw-cap-like lid on this one. Apart from the lid, the rest of the bottle is rather unspectacular and quite simple. Yes, as I wrote at the beginning, I don't think this fragrance is so great. I even find the base horrible. It smells very banal to me, I find other mainstreamers (which, by the way, also have quite synthetic notes, so that's not necessarily the reason) much better, like CK for example. And no, that's not because my nose, after so many scents, would meanwhile think of itself as something better, which only likes more expensive niche scents, no, that's much more because this scent got on my nerves because of its dry and sourish-sticky floral notes with its very unpleasant scent. Anyway, this fragrance is good for anyone who still likes it, good for spring and summer, if you want to suffocate easily,... um... I actually meant if you're looking for something loose, fresh and not so strong, which doesn't get on anyone's nerves at work or anywhere else. But in my opinion one will not notice him either, so that he is therefore not suitable for going out. I'm obviously one of the minority that agrees with this fragrance being a fruity floral. Hugo Woman is crisp, fruity and only mildly floral to my nose. I found that this fragrance took a while to grow on me. At first I didn't like its sharpness in the opening, however giving it an hour to develop, I must say that I quite like it. The scent is pretty strong, but never cloying. 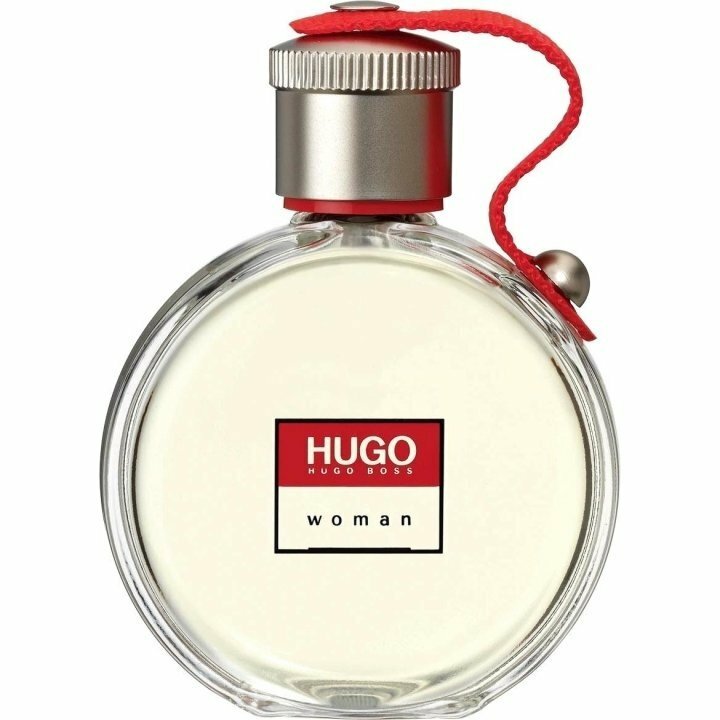 Hugo Woman smells like apple puree and tropical fruit juice. The crisp green apple note is for me the most dominant note in this fragrance, followed by black currant, melon and papaya. The presence of the vanilla towards the drydown, keeps the scent from becoming too fruity and sharp. The vanilla adds a nice feminine and sweet touch, which makes Hugo Woman quite delicious. I don't think this is the right fragrance to make a statement like the adverstising seems to suggest. Although inoffensive and pleasant, I don't find it to be particularly unique in any way. Just a nice, casual fragrance which would make a good staple in someone's wardrobe. Write the first Review for Hugo Woman (Eau de Toilette)!